Buried Treasure is a 4-player minigame that is found during the events of the Nintendo 64 game Mario Party. Players attempt to dig around the earth to find the treasure chest to win. The minigame takes place inside within the depths of the earth as there are rocks and layers of soil and dirt inside. 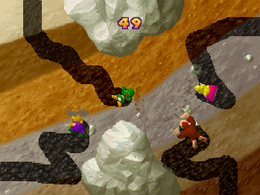 The four players from each corner dig deep into the earth as they appear in the minigame. Shortly after that, the minigame starts. Players have to find the treasure chest buried somewhere in the dirt by digging around the layers of dirt within the time limit of sixty seconds. There are two types of dirt: Earth and Rock. Earth is fairly easy to dig through the tunnels since its spread throughout the area. Rock on the other hand is difficult to dig through, and they are located at the top and the bottom of the area. To make the minigame a bit easier, the players can find a few hidden arrows that are buried in the area. The arrows can help the players point to where the Treasure Chest is located in the minigame. The first player who finds the Treasure Chest wins the minigame. The minigame can be purchased from the Mini-Game House for one-hundred and fifty Coins when it is available for a purchase. Game Rules – "Uncover the hidden arrows and try to find the Treasure Chest. Press to repeatedly dig. Rocks are harder to dig through." Advice – "The hidden arrows show the way to the hidden Treasure Chest." This page was last edited on November 6, 2017, at 21:20.